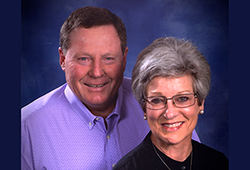 Although Ron and Cindy Ward planted their roots about 90 miles from Stillwater, they remain loyal to the orange and black of Oklahoma State University. The couple has long been supportive of their alma mater as well as other educational support groups such as the Oklahoma City Public Schools Foundation and the El Reno Public Schools Foundation. Since 1975, the couple has owned and operated Ward Construction and recently received proceeds from a limited partnership interest. They sought advice from their friend and financial advisor, Bill Trammell with Edward Jones Investments in Edmond. When the opportunity came about for the couple to take action, it was important they find a foundation where they could contribute a set amount of money and that it would be available in perpetuity. Mr. Trammell says there were a number of opportunities out there, but after witnessing how the Oklahoma City Community Foundation has worked with other Edward Jones advisors and their clients, the ease at which the process works, the very fair cost-structure and the ability to utilize American Funds for investment purposes, it just made sense. "As an advisor, it's nice to know that you are still able to work with the assets and you still have control as if the funds were in your office," he adds. Mr. Trammell was able to connect the Wards with Joe Carter at the Oklahoma City Community Foundation. While talking with Joe, the couple learned that an advised fund, specifically a gift fund, was a perfect fit. It would let them establish a personal giving program with simplicity, flexibility and the couple would receive the maximum tax benefits possible. "It will allow us flexibility to put the money in as a lump sum or add to it overtime," Mr. Ward said. "We will have some input on how the fund is managed and what charitable organizations will be supported. As my wife and I grow older, we can add to it and our family can carry it forward." Mr. Ward added that he thinks the Oklahoma City Community Foundation is an incredible tool. It's a very easy way to do foundation or charitable-type work and be able to facilitate in a manner that gets the "best bang for your buck." It doesn't take a lot of legal work or specific consulting. "I've recommended the foundation to several people and they are pretty impressed with how the process worked," he adds. Mr. Trammell echoed his clients' sentiment: "Joe is very good at explaining about where the money can go, what the money can do and the best way to accomplish this for the benefit of the client and the benefit of not paying as much in taxes." The Oklahoma City Community Foundation offers three types of advised funds that are designed to meet the unique needs of your clients. They can be established with cash or other assets and donors are able to focus on giving back while we take care of the administration and reporting requirements. Our advised fund options include two permanent endowments that benefit from the performance of our pooled investments and one that is a completely spendable fund. Learn more about our advised funds here. If you have any questions, please contact Joe Carter at j.carter@occf.org or at 405/606-2914.